On May 30, 2018, Heffel Fine Art Auction House will host two auctions. While the afternoon sale will focus on 60 pieces of Post-War & Contemporary Art and includes several gems by the likes of Paul-Émile Borduas and Jack Hamilton Bush, the evening sale of 56 examples of Canadian Impressionist and Modern Art is also likely to draw the enthusiastic attention of bidders. One of the highpoints of the evening sale is sure to be this oil on board from 1924 by Lawren Stewart Harris (1885-1970). 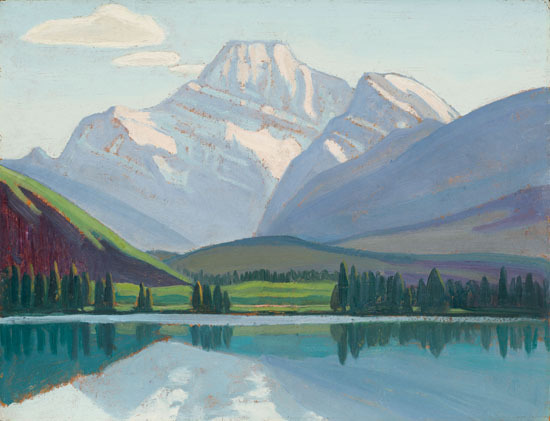 Titled “Mount Edith Cavell,” the diminutive (26.7 x 34.9cm) painting was produced during a sketching trip in Jasper National Park with fellow Group of Seven artist A.Y. Jackson, who has about a dozen pieces in the evening Heffel sale. 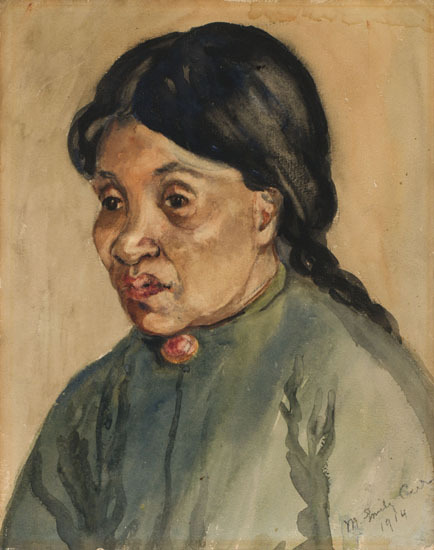 More intimate in scope is this small (24.1 x 19.1cm) watercolor by Emily Carr (1871-1945). Signed and dated 1914 on the front, the portrait is identified on the back as "Sophie Frank (Emily's Indian Friend)." Frank was a Squamish woman with whom Carr was quite close. In fact, the artist dedicated her autobiographical book, “Klee Wyck,” published in 1941, to Frank, whose portrait, seen here, appeared on the book’s frontispiece. 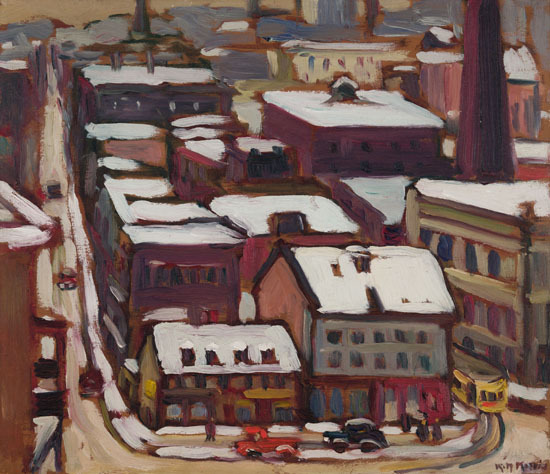 Another prominent female Canadian artist from the first half of the 20th century was Kathleen Moir Morris (1893-1986), whose oil on board from 1929 titled “Craig Street, Montreal” (30.5 x 35.6cm) is the sole piece by the artist in the May 30 auction. Part of Montreal’s Beaver Hall Group, Morris also lived in Ottawa and Quebec. As an urban artist, her paintings frequently included street scenes, markets, and cab stands. Finally, we turn our attention to Edwin Headley Holgate (1892-1977), who was a founder of the Canadian Society of Graphic Art and painted this oil on canvas (38.1 x 43.2cm) in 1950 after serving in World War II as an official war artist with the Royal Canadian Air Force. 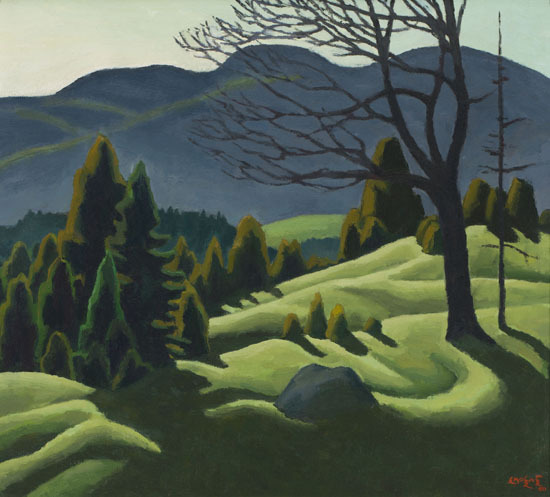 Though he had been a key figure in the Montreal art scene, Holgate had no affinity for postwar abstraction, so he moved to the Laurentian Mountains north of Quebec, where he painted works such as “Twilight in June,” shown here. Find all Heffels lots at Barnebys!